Anders has been riding mountain bikes around the hills of Wellington since MTB first arrived in New Zealand in the early 80’s. He has raced MTB and road bikes ever since and has competed in the Karapoti Classic 15+ times. As a very tall rider Anders struggled with standard bikes so decided to create his own to see if he could improve his enjoyment of the sport by riding a bike that matched his body type. After experimenting with 3 or 4 of his own designs he created a bike that felt so much better than the off-the-peg mountain bikes he had been riding that he was hooked. He began to design frames for other non-standard riders and soon realised there are many frustrated mountain bikers putting up with mismatched frames. 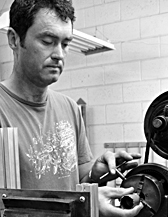 Anders spent a couple of years as a bike mechanic in Europe before returning to Wellington to set up Crucial Custom Cycles. What next? 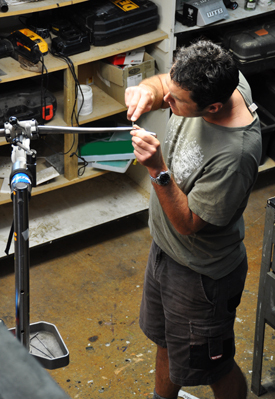 He is now experimenting with sweeping curved tubing which he’s hoping to soon incorporate into his custom mountain bike designs. I’m going to be the crash-test dummy for the next wee while. Its all about being creative with bikes and making something that really works well for a rider.